Communicating with your allies in multiplayer KaM games is essential. The only problem is that often there is no time to type out a message, you really need to shout out to your ally: “Look out! Move your soldiers!” or something similar, but you are unable to. Well, now there is a solution to this problem! A kind fan by the name of TieSTo has allowed us to use some channels on a TeamSpeak server. 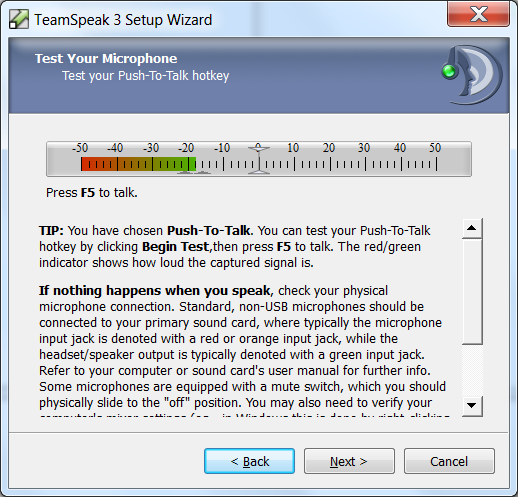 TeamSpeak is a program that allows you to enter a channel and talk with everyone in that room at once, either by pressing a key to activate your microphone or having your microphone activate automatically when it detects sound. It’s like Skype in a chat room. I have used TeamSpeak in a few KaM games already and I found it to be very useful. It’s much easier to work together with your allies and alert them of danger without the need to type. You can also chat and make friends while building your village. Even if you don’t have a microphone or don’t want to talk, listening to your allies is still very useful. Below are instructions for installing and using TeamSpeak with this server. Step 3. Start TeamSpeak and follow the Setup Wizard that will help you configure it the first time. Enter a nickname for yourself. Step 4. Choose between Voice Activation Detection (transmits when it detects you speaking) or Push-To-Talk which will only transmit when you hold down a chosen key (you can change these things later from Settings). On the next screen you can test your microphone volume. Step 5. At the end of the wizard uncheck “Open public server list” and “Rent your own TeamSpeak server” before you finish (you will be using the KaM TeamSpeak server so neither of these options are necessary). Step 6. Next to add the KaM TeamSpeak server click Connections on the main menu then Connect. In Server Address put: kamts.eu and click connect (there is no password). Step 7. Scroll down to the channel “Knights and Merchants” and double click on one of the channels there to join it. Note: This server is not only used for Knights and Merchants, so please only use the channels under “Knights and Merchants”. Step 8. You can now talk to everyone in that channel! Ask your friend and allies to join you so you can communicate easily while you play. You can use whatever languages you like in the server, we don’t mind at all. There are currently 5 channels available so if one is already in use pick and empty one. We will create more channels if it is needed. Kérhetek egy ts3 szobát Magyar nével és magyar logo val ? It is better to ask one of the moderators in TS rooms. How to join it? I can not get permission.